I just had a memory of when the midwife phoned me a few days after I’d got out of hospital. I’d already spoken to one lady for her to arrange a time to come over, but we were busy with things like registering Freddie’s stillbirth (it sounds like the strangest thing to say – like registering birth and death all in one super-fast swoop.. I guess that is precisely what it does) and arranging the funeral, that she said that she would get someone to phone the next day. So the next day, someone phoned and asked me when exactly I’d had my baby and how he was doing. I told her coldly that she obviously did not have her notes in front of her because my baby was born on Friday and he was not alive. She went silent for a few seconds, obviously collecting her jaw from the floor, and trying to think of what she could possibly say to excuse her extremely grim mistake, and then apologised profusely. I tried to be kind but I felt so angry that I’m not sure I was convincing. It made me think that there must not be many women in my situation if the midwife thought it was okay just to phone around without checking her notes first. I’m feeling a bit more troubled than I have over the last few weeks. I think it’s because I’m expecting for my ‘Ovarian Operating System’ to ‘reboot’ (please see post ‘Trolling for Vampires’ for an explanation of that euphemism…). So I’m probably experiencing the normal sort of hormonal fluctuations, combined with the pressure of waiting for something that brings more bad news, if it comes. 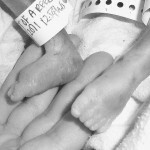 It’s also difficult to know when exactly to start getting hopeful – over the 4 ‘reboots’ I had in the months between losing my baby girl and getting pregnant with Freddie, they came later and later every month. And of course, each time I got hopeful, only to be deeply disenchanted when my reboot occurred a day or two later than it had the previous month. I’m feeling the urge to ‘sort’ things quite a lot at the moment – drawers, wardrobes, cupboards – particularly my wardrobes as they’re full of a strange mish-mash of different sized clothes which I’ve accumulated over the last 18 months or so, there’s even some maternity items which have escaped my previous attempts at clothes-based crackdowns. I feel a bit sort of ‘cheated’ though, having to stuff all my size 8/10 apparel into bin bags, as well as the maternity clothes, again. Removing all your pre-pregnancy clothes when you’re actually pregnant is quite exciting – it emphasises the reality of your experience as your body grows. But when you’re not pregnant, and you’re having to tidy away your smaller, pre-pregnancy clothes AND the maternity stuff, it’s just sad. But, it helps to feel a bit more orderly, I suppose it’s another control thing. Anyway, I’m off to bag up some small clothes – the attic’s getting pretty full. 2 Responses to Administration problems and orderliness. Changing your clothes over! This is a school boy error! You should have stretched out all your pretty skinny clothes for an excuse for a new wardrobe later! There is still time, get some lunges done in some jeans!!!! My little baby between Sebby and Roo, was completely ignored too, I still received appointments for scans/bloods and check-ups, so I completely understand! As for the midwives, WELL that is just disgusting, and i would promptly have been on the phone to the head midwife, tears and fury! KEEP GOING, KEEP BUSY, and cry when you have to! Thanks for the pep talk, it’s given me the bit of grit I needed to get on with things today!